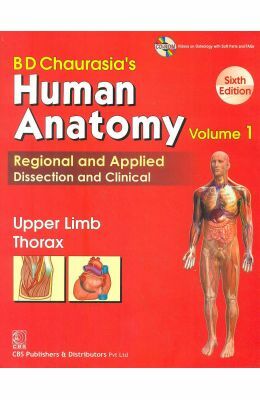 Human Anatomy Upper Limb Thorax is a comprehensive book for undergraduate students of Medicine. The book comprises of chapters on bones of upper limb, pectoral region, scapular region, forearm and hand, joints of upper limb, wall of thorax, thoracic cavity and the pleura, pericardium, and the heart. In addition, the book consists of several detailed diagrams and illustrations for the students to understand the concepts better. This book is essential for medical students preparing for various postgraduate medical entrance examinations. Dr. B. D. Chaurasia is an Indian academic author and educationist. He has authored several books including Handbook Of General Anatomy and Human Anatomy For Dental Students: Regional And Applied Anatomy, Clinical Applications, Dissection.